This book uses four different POVs (one for everyone in the team) and sometimes it was just confusing, and I had to return to the start of the chapter to see which POV I was reading at that time. There just wasn't enough differentiation between the characters, which is very important if you decide to use multiple POVs. The four kids actually don't really know each other, except they go to the same school, but they share no friends, still even before they team up they are continually mentioning each other. 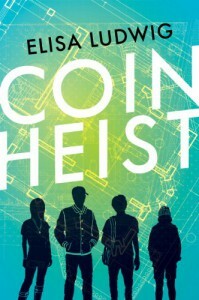 (It's almost as if they knew what was going to happen :P ) The story is very slow in the beginning, it takes quite some time for the planning to actually start (and as this book is called Coin Heist, it's no surprise what the plan is going to be.